**** Chosen by Winner: Teresa K.
Hogue Knives' second offering in the Extreme Series is the EX-F01 Tactical Fixed Blade Knife, designed by Allen Elishewitz. The EX-F01 knife is tough, with a 1/4" thick A2 tool steel blade this tactical fixed blade isn't the type to let you down. The 7" KG Gun-Kote finished drop point blade is full tang with an extended breaker at the base. The shape and contour of the handle offers extreme comfort and grip with the index groove below and spine notches up top. The Cocobolo wood scales are beautiful and supremely contoured for a grip that you'd expect from Hogue. The EX-F01 includes a black ballistic nylon sheath with a MOLLE compatible back. 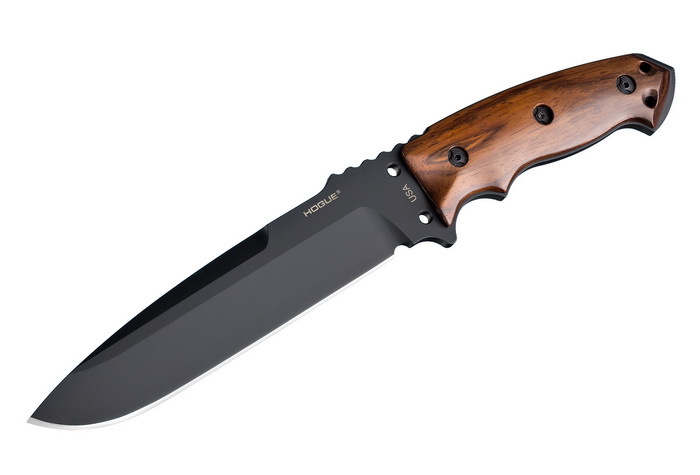 This model has a black KG Gun-Kote finish 7" Drop Point blade and Cocobolo wood Scales. Hogue Knives ares built upon precise engineering and stringent manufacturing practices that yields exceptional performance. Hogue, Inc. is a family owned and operated business that was founded in 1968 by Guy Hogue. Guy’s legacy of innovative, high-quality American engineering and craftsmanship has been carried forth under the leadership of his sons Aaron and Patrick, his grandson Neil and by Hogue Tool and Machine president Jim Bruhns. Hogue Knives are designed by former Marine Recon, martial artist and custom knife-maker Allen Elishewitz. Partnering with Elishewitz as the minds behind Hogue Knives is Master Tool Maker Jim Bruhns. Their design and engineering talents ensure that every knife delivers the best possible fit, finish and function. With their long history of tool making experience, entering the knife industry was a natural addition to the Hogue Incorporated manufacturing business. They unveiled their initial releases in 2010. Their line has grown dozens of models with over 200 variations, along with sheaths and pouches to fit most every need.